The Indian Coast Guard, an Armed Force of the Union, offers a inspiring profession to young and active Indian male as well as female applicants for various branches as an Assistant Commandant(Group ‘A’ Gazetted Officer). Indian Coast Guard invites ‘online’ application for these Government jobs. 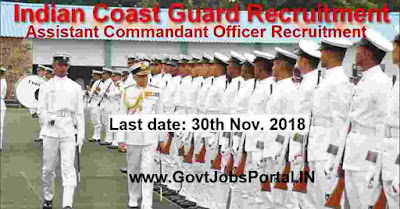 More information related to this Indian Coast Guard Recruitment process is given below in this article. Read it out carefully if you want to know more about this recruitment procedure. Graduation degree with 60%marks and Mathematics and Physics as subjects up to 12th class as well as in Graduation. math subjects with 60% marks and must have current /valid Commercial Pilot Licence (CPL) issued/ validated by (DGCA). LLB Degree with 60% marks can apply. 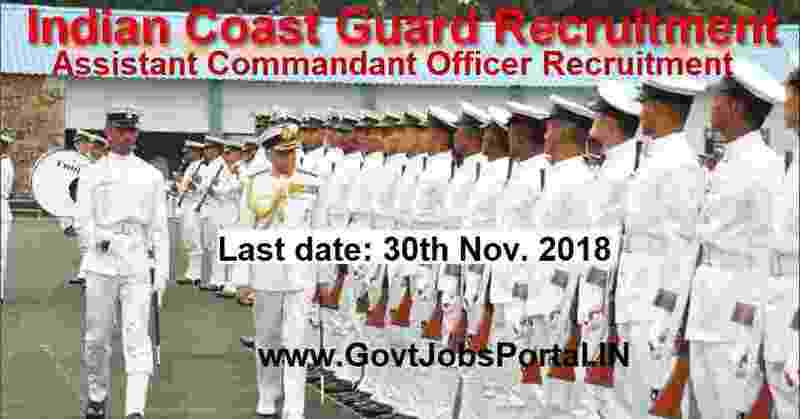 If you satisfied the eligibility conditions which we explained above in the table can apply for this Indian Coast Guard recruitment 2018 without paying any application fee. ZERO application fee for applying. 18TH Nov. 2018 is the Start Date. (i) The name of the candidate, father/mother's name and date of birth should be same as mentioned in the 10th class passing certificate. Any mismatch in name & date of birth in the application, is liable for rejection.